Supported by our sophisticated infrastructure, we are capable of providing a large gamut of Oil Filter Machine to our valued clients. Normally, the deteriorated oil in this machine by contamination of foreign particles, moisture and oxidation sludge that affects the performance of the equipment is removed. Available in different technical specifications, the offered filtering machine is available for our clients at industry leading prices. 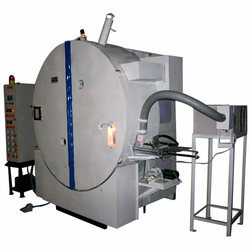 We are offering Roll Varnish Machine to our clients. Designed with the assistance of our advanced technology, this machine is used to varnish all types of winding parts like rotors, coils, stators, transformer stack windings and small electronics transformers. We can also custom design our range as per the specific requirements of our clients. We are one of the leading manufacturers, suppliers, and exporters of Transformer Oil Filter Machine. Designed with the assistance of our engineering excellence this, transformer oil filter machine has an enclosed construction with fabricated canopy with doors for operational fluency and low maintenance. 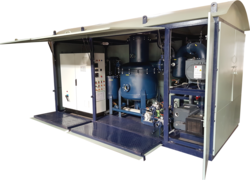 Our range of standard high-vacuum filtration and dehydration plants are used to remove moisture (free as well as dissolved), grasses, dirt, and oxidation products from mineral-based, synthetic and silicon oils. Highly suitable for on-site operation, these transformer oil filter machine can be towed with jeep or tractor. We have crafted a strict foothold in the industry by offering a premium quality collection of Centrifugal Oil Purifier to our customers. This operates on the reaction turbine principle and removes very fine dirt from oil. Moreover, our highly competent engineers develop this range with high precision so as to meet diverse industry needs effectively and offered to the clients within the limited frame of time. We are engaged in presenting an extensive range of Vacuum Pressure Impregnation System to our clients. 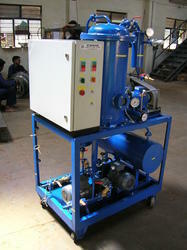 This system is developed using high-quality components as per with industrial norms. These are specifically designed for filtration and dehydration of hydraulic oil, turbine oil, and thermic fluid. These plants work on heating, filtration and vacuum principle. These plants are suitable for the machine to machine filtration, as they are compact in size and light in weight and easily handled with two persons. 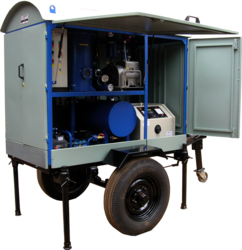 These plants are suitable for remote site filtration as they can be carried in small rickshaw tempo. Our plant specialty is the removal of free as well as emulsified water from the oil along with particles up to 1 micron such as oxidation sludge, colloidal carbon, dirt, etc. Filtration is efficient and very fast due to specially molded cellulose cartridges. These plants require a nearly unattended operation as oil level is controlled by a float switch. We are one of the leading manufacturers, suppliers, and exporters of High Vacuum Transformer Oil Filtration Plant. Designed with the assistance of our engineering excellence this, two stage degassing system has an enclosed construction with fabricated canopy with doors for operational fluency and low maintenance. 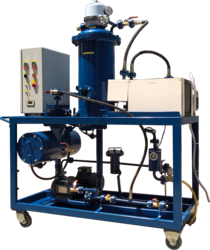 Our range of standard high-vacuum filtration and dehydration plants are used to remove moisture, gasses, dirt and oxidation products from mineral-based, synthetic and silicone oils. Highly suitable for on-site operation, these transformer oil filtration plant can be towed with jeep or tractor. 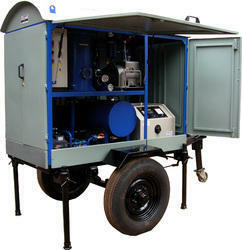 We are offering Portable Transformer Oil Filtration Plant. Designed in line with international quality standards, this Portable Transformer Oil Filtration Plant is available with open construction without the canopy. This Portable Transformer Oil Filtration Plant is highly suitable for indoor movement and for on-site operation, these plants can be carried in the vehicle. Since 1988, we, AR Engineering an ISO 9001:2015 certified company are engaged in manufacturing, supplying, importing and exporting of Oil Filter Plants and Machinery. With an industrial experience of many years, we are engaged in offering Oil Filter Machine,Roll Varnish Machine,Transformer Oil Filter Machine,Oil Purifier,Vacuum Pressure Impregnation System,Portable Oil Filtration Plant,High Vacuum Transformer Oil Filtration Plant,Portable Transformer Oil Filtration Plant,Industrial Oil Purification Systems,Oil Dehydration Plants,Transformer Oil Dehydration Plants,Impregnation Machine and Plants,Hydraulic Oil Filtration Equipment,Transformer Oil Filtration Plants,Turbine Oil Cleaning System. In addition to this, we also offer Installation and Maintenance Services to our valuable clients. Designed in accordance with international quality standards, these are widely acknowledged for precision functioning, negligible maintenance, and longer service life. Due to the diversity in our range of plants, we cater to the requirements of transformer & capacitor manufacturers, transformer owners and oil filtration service providers in an efficient manner. With the assistance of our advanced technology and service support of experienced professionals, we have been able to meet the requirements of our clients in the best possible manner. From oil filtration service providers to reputed patrons like BHEL, NTPC, and NHPC, we have served our clients to best of our abilities. Our systematic and streamlined methodology has enabled us to acquire vast clientele not only in India but also across Gulf Countries, South Asian Countries and African Countries and also import from Japan and Germany. L 77, Additional M. I. D. C.